Free juggling lessons return to the park next week with our all new after-work sessions. 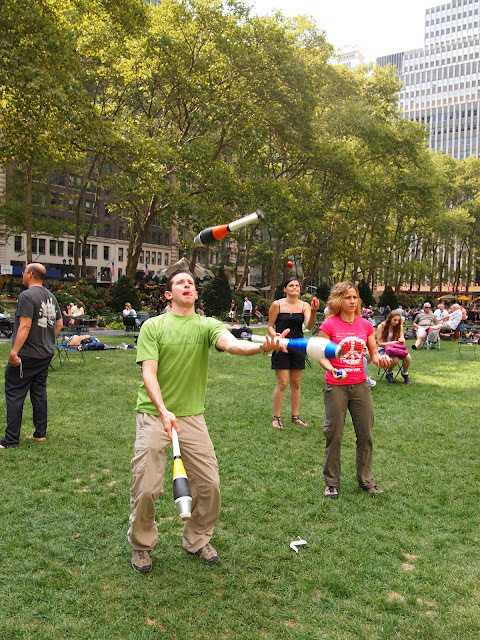 Find our Bryant Park Juggling teachers, Alex and Jordan, near the Carousel on 40th Street every Tuesday evening for a juggling skills clinic and meetup. All skill levels are welcome. Whether you are struggling to toss two balls or you're a pro, who can juggle seven pins, you'll have fun at our weekly sessions. Later in the summer, we'll continue our regular Friday afternoon juggling sessions on the lawn as well.